Take your photographic vision to the next level with the interesting Won Muslin Xcanvas Aranjuez 10x10' Background. The Muslin Xcanvas Series of backgrounds is comprised of very unique scenic muslins produced with a sophisticated and meticulous hand-painting process. Xcanvas muslins stimulate the imagination and memories of classical times. As with any background depicted on the Internet, colors displayed may vary slightly, due to differences in computer monitors, printed media, and variances in manufacturer's fabrics, dyes or paints. Won offers backgrounds with unique styles and fine craftsmanship by maintaining its own group of distinguished artists, painters and skilled technicians. Won maintains its pace with new trends by developing new designs, coloring pigments and creating new materials. 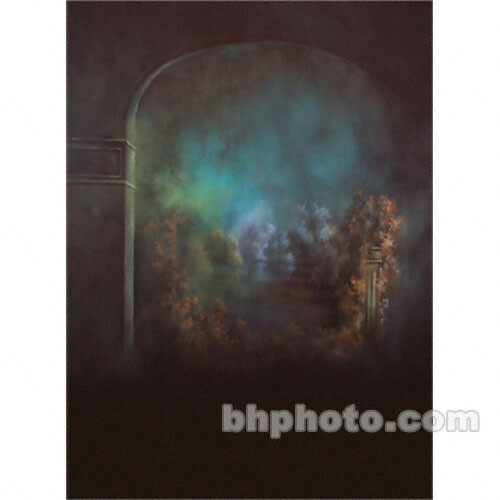 Muslin Xcanvas Background - Aranjuez - 10x10' is rated 4.0 out of 5 by 1. Rated 4 out of 5 by Juan Randall from Classically done I am very happy with the product. It will serve my needs well. It is well made and easy to use. My only suggestion would be to install three or four Velcro straps on the backside along the right and left edges to make it easy to attach to whatever frame you might be using. But I found large metal clamps to work well. Will the Won Muslin Xcanvas backgrounds work on the Delta 1 Muslin Mover Rail System or are they too stiff? This background would be too stiff to work on the Delta 1 Muslin Mover. OK Kirk if the Won Muslin Xcanvas is too stiff for the Delta 1 Muslin Mover how are the hung? Is the top looped so you can run the top cross beam through? I note when it is shipped it is folded to 17.0 x 15.0 x 4.0&quot;???? OK If Won Muslin backgrounds are to stiff for Delta 1 Muslin Movers how do you hang these backgrounds?